کریمی, مجید, قاجار, رحمت‌الله, منتظری هدش, عباس. (1396). بررسی تأثیر طول نانولوله و پدیدۀ کلوخه شدن بر رفتار الاستوپلاستیک نانوکامپوزیت پلیمری. 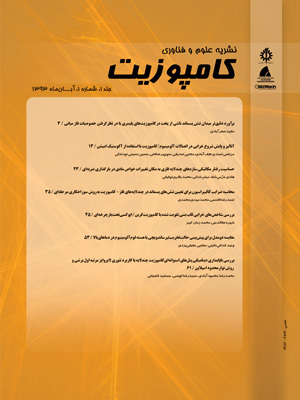 علوم و فناوری کامپوزیت, 4(2), 229-240. مجید کریمی; رحمت‌الله قاجار; عباس منتظری هدش. "بررسی تأثیر طول نانولوله و پدیدۀ کلوخه شدن بر رفتار الاستوپلاستیک نانوکامپوزیت پلیمری". علوم و فناوری کامپوزیت, 4, 2, 1396, 229-240. کریمی, مجید, قاجار, رحمت‌الله, منتظری هدش, عباس. (1396). 'بررسی تأثیر طول نانولوله و پدیدۀ کلوخه شدن بر رفتار الاستوپلاستیک نانوکامپوزیت پلیمری', علوم و فناوری کامپوزیت, 4(2), pp. 229-240. کریمی, مجید, قاجار, رحمت‌الله, منتظری هدش, عباس. بررسی تأثیر طول نانولوله و پدیدۀ کلوخه شدن بر رفتار الاستوپلاستیک نانوکامپوزیت پلیمری. علوم و فناوری کامپوزیت, 1396; 4(2): 229-240. در این مقاله خواص الاستوپلاستیک یک نانوکامپوزیت پلیمری با تکیه بر تعدادی از عوامل مقیاس مزو مورد بررسی قرار گرفته است. برای این منظور از ترکیب روش اجزای محدود با میکرومکانیک استفاده شده است. با توجه به ماهیت پیوند ناکاملِ نانولوله و ماتریس، برای جایگزین کردن نانولوله و ناحیه­ی مشترک با یک تک‌رشته­ی توپر، از روش چندمقیاسی اجزای محدود استفاده شده است. سپس با استفاده از روش میدان میانگین موری- تاناکا، منحنی‌های تنش-کرنش نانوکامپوزیت استخراج و با استفاده از آن، تأثیر زاویه­ی قرارگیری نانولوله بر مدول یانگ، تأثیر طول نانولوله بر خواص الاستوپلاستیک و تأثیر کلوخه شدن نانولوله‌ها بر رفتار الاستوپلاستیک بررسی شده است. همچنین با بررسی طول نانولوله‌ها مشخص شد که نانولوله‌های دارای طول 10 تا 300 نانومتر، تأثیر قابل توجهی بر سفتی نانوکامپوزیت دارد، درحالی‌که تأثیر طول‌های کوتاه‌تر و بلندتر چندان قابل توجه نیست. همچنین، با صرفنظر از کلوخه شدن، افزایش کسر حجمی نانولوله‌ها منجر به افزایش سفتی نانوکامپوزیت می‌گردد. این در حالی است که کلوخه شدن نانولوله‌ها، منجر به کاهش سفتی نانوکامپوزیت می‌شود. تأثیر منفی این پدیده به‌حدی است که در برخی موارد، افزایش کسر حجمی نه‌تنها باعث افزایش سفتی نانوکامپوزیت نمی‌شود، بلکه آن را کاهش می‌دهد. In this article, elastoplastic properties of polymeric nanocomposites embedded with carbon nanotubes (CNTs) are explored with emphasis on the meso-scale phenomena. To this end, a combination of finite element method and micromechanics is implemented. Accordingly, at first, considering the non-bonded nature of nanotube/polymer interactions, a multiscale finite element method is employed to replace the matrix, CNT, and polymer atoms neighboring it with a perfectly bonded equivalent nanofiller. Subsequently, nanocomposite stress-strain curves are extracted based on the mean field homogenization approach. Using this model, the effects of CNTs orientation and their agglomeration on the mechanical behavior of nanocomposite samples are thoroughly studied. Moreover, it is found that to have an efficient reinforcing effect, the CNT length should be greater than 10 nm. On the other hand, it can be concluded that there is an optimum value of this parameter (i.e. 300 nm) above which, there is no any extra stiffening effect. Furthermore, regarding the CNTs agglomeration, it is revealed that although, theoretical investigations show that increasing CNT volume fraction(VF) leads to an increase in the stiffness, occurring this phenomenon can have a deteriorative role in terms of influencing the mechanical behavior of these nanocomposites at higher VFs. Shima, H. and Sato, M., “Elastic and Plastic Deformation of Carbon Nanotubes,” First ed., Pan Stanford Publishing, Boca Raton, pp. 187-208, 2013. Moon, C. K., Lee, J.-O., Cho, H. H. and Kim, K. S., "Effect of diameter and surface treatment of fiber on interfacial shear strength in glass fiber/epoxy and HDPE," Applied Polymer Science., Vol. 45, pp. 443–450, 1992. Bao, S. P. and Tjong, S. C., "Mechanical behaviors of polypropylene/carbon nanotube nanocomposites: The effects of loading rate and temperature," Materials Science and Engineering A, Vol. 485, No. 1-2, pp. 508-516, 2008. Gojny, F. H., Wichmann, M. H. G., Fiedler, B. and Schulte, K., "Influence of different carbon nanotubes on the mechanical properties of epoxy matrix composites-a comparative study," Composites Science and Technology, Vol. 65, No. 15–16, pp. 2300-2313, 2005. Rafiee R. and Maleki Moghadam, R., "On the modeling of carbon nanotubes: a critical review," Composites Part B: Engineering, Vol. 56, pp. 435-449, 2014. Tserpes, K. I., Papanikos, P., Labeas, G., and Pantelakis, S. G., "Multi-scale modeling of tensile behavior of carbon nanotube-reinforced composites," Theoretical and Applied Fracture Mechanics, Vol. 49, pp. 51-60, 2008. Li, C. and Chou, T.-W. "A structural mechanics approach for the analysis of carbon nanotubes," International Journal of Solids and Structures, Vol. 40, pp. 2487-2499, 2003. Shokrieh, M. M. and Rafiee, R., "On the tensile behavior of an embedded carbon nanotube in polymer matrix with non-bonded interphase region," Composite Structures, Vol. 92, pp. 647-652, 2010. Shokrieh, M. M. and Rafiee, R., "Investigation of nanotube length effect on the reinforcement efficiency in carbon nanotube based composites," Composite Structures, Vol. 92, pp. 2415–2420, 2010. Montazeri, A., and Naghdabadi, R., "Investigation of the interphase effects on the mechanical behavior of carbon nanotube polymer composites by multiscale modeling," Applied Polymer Science, Vol. 117, pp. 361–367, 2010. Montazeri, A. and Naghdabadi, R. "Study the effect of viscoelastic matrix model on the stability of CNT-polymer composites by multiscale modeling," Polymer Composites, Vol. 30, pp. 1545-1551, 2009. Joshi P. and Upadhyay, S. H. "Analysis of alignment effect on carbon nanotube layer in nanocomposites," Physica E, Vol. 66, pp. 221-227, 2015. Huang, J. and Rodrigue, D., "The effect of carbon nanotube orientation and content on the mechanical properties of polypropylene based composites," Materials and Design, Vol. 55, pp. 653–663, 2014. Huang, J., and Rodrigue, D., "Equivalent continuum models of carbon nanotube reinforced polypropylene composites." Materials and Design, Vol 50, pp. 936-945, 2013. Buryachenko, V., “Micromechanics of Heterogeneous Materials,” First ed., Springer Science & Business Media, pp. 571-606, 2007. Qu J. and Cherkaoui, M., Fundamentals of micromechanics of solids: John Wiley & Sons, 2006. Zare, Y. and Garmabi, H., "Attempts to simulate the modulus of polymer/carbon nanotube nanocomposites and future trends," Polymer Reviews, Vol. 54, No. 3, pp. 377-400, 2014. Bernardo, L. F. A., Amaro, A. P. B. M., Pinto, D.G., and Lopes, S. M. R., "Modeling and simulation techniques for polymer Nanoparticle Composites – A review," Computational Materials Science, Vol. 118, pp. 32–46, 2016. Seidel G. D. and Lagoudas, D. C., "Micromechanical analysis of the effective elastic properties of carbon nanotube reinforced composites," Mechanics of Materials, Vol. 38, , pp. 884–907, 2006. Odegard, G, M., Gates, T. S. , Wisea, K. E., Parka, C., and Siochi, E. J., "Constitutive modeling of nanotube–reinforced polymer composites," Composites Science and Technology, Vol. 63, pp. 1671-1687, 2003. Fisher, F. T., Bradshaw, R. D. and Brinson, L. C., "Fiber waviness in nanotube-reinforced polymer composites-I: Modulus predictions using effective nanotube properties," Composites Science and Technology, Vol. 63, No. 11, pp. 1689–1703, 2003. Meguid, S. A., Wernik, J. M., and Cheng, Z. Q., "Atomistic-based continuum representation of the effective properties of nano-reinforced epoxies," International Journal of Solids and Structures, Vol. 47, pp. 1723–1736, 2010. Georgantzinos, S. K., Giannopoulos, G. I. and Anifantis, N. K., "On the coupling of axial and shear deformations of single-walled carbon nanotubes and graphene a numerical study," Proceedings of the Institution of Mechanical Engineers, Part N: Nanoengineering and Nanosystems, Vol. 224, No.1, p. 1740349911412874, 2011. Shokrieh M. M. and Rafiee, R., "Prediction of mechanical properties of an embedded carbon nanotube in polymer matrix based on developing an equivalent long fiber," Mechanics Research Communications, Vol. 37, No.1, pp. 235–240, 2010. Sakhaee-Pour, A., Ahmadian, M. T. and Naghdabadi, R., “Vibrational analysis of single-layered graphene sheets,” Nanotechnology, Vol. 19, No. 8, pp.200-210, 2008, 085702. Borja, R. I., “Plasticity Modeling & Computation”, First edition., Springer-Verlag, Berlin Heidelberg, pp. 31-58, 2013. Khan A. S. and Huang, S., “Continuum Theory of Plasticity” John Wiley and Sons, New York, Cambridge, pp. 119-180, 1995. Gross, D. and Seelig, T., “Fracture Mechanics with an Introduction to Micromechanics” Springer-Verlag, Berlin Heidelberg, pp. 217-287, 2011. Weng, G. J. "The overall elastoplastic stress-strain relations of dual-phase metals." Journal of the Mechanics and Physics of Solids, Vol. 38, No 3, pp. 419-441, 1990. Qiu, Y. P. and Weng, G. J., "On the application of mori-tanaka’s theory involving transversely isotropic spheroidal," International Journal of Engineering Science, Vol. 28, No. 11, pp. 1121-1137, 1990. Ginsberg, J., “Engineering Dynamics”, Second ed., Cambridge University Press, pp. 91-172, 2008. Stephan, C., Nguen, T., Chapelle, M. and Lefrant, S., "Characterization of single-walled carbon nanotubes-PMMA composites," Synthetic Metals, Vol. 108, No. 2, pp. 139-149, 2000. Shi, D.-L., Feng, X.-Q., Huang, Y. Y., Hwang, K.-C. and Gao, H., "The effect of nanotube waviness and agglomeration on the elastic property of carbon nanotube-reinforced composites," Engineering Materials and Technology, Vol. 126, No.1, pp. 250-257, 2004. Gojny, F., Wichmann, M., Kopke, U., Fiedler, B. and Schulte, K., "Carbon nanotube reinforced epoxy-composites: Enhanced stiffness and fracture toughness at low nanotube content," Composites Science and Technology, Vol. 64, No. 15, pp. 2363–71, 2004. Frankland, S. J. V., Harikb, V. M., Odegard, G. M., Brenner, D. W. and Gates, T. S., "The stress–strain behavior of polymer–nanotube composites from molecular dynamics simulation," Composites Science and Technology, Vol. 63, No. 11, pp. 1655–1661, 2003. Yang, S., Yu, S., Ryu, J., Cho, J.-M., Kyoung, W., Han, D.-S., "Nonlinear multiscale modeling approach to characterize elastoplastic behavior of CNT/polymer nanocomposites considering the interphase and interfacial imperfection," International Journal of Plasticity, Vol. 41, No.1, pp. 124-146, 2013.
behavior of CNT-polymer nanocomposites," Composite Structures, Vol. 160, No.1, pp.782-791, 2017. Mohammadpour, E., Awang, M., Kakooei, S. and Akil, H. Md, "Modeling the tensile stress–strain response of carbon nanotube/polypropylene nanocomposites using nonlinear representative volume element," Materials and Design, Vol. 58, No.1, pp. 36–42, 2014.